Should I update my desk with wallpaper to break up the span of wood? Take a look at the options I’m considering and weigh in! Ever since I purchased my office desk, I’ve been pondering ways to break up the span of wood. I find the unit as a whole dark and heavy. But, when Pottery Barn was clearing out their basement stockroom combined with their friends and family event a couple years ago, I couldn’t pass up the bargain pricing. I knew I could make it work, especially since it had the functionality I was looking for. 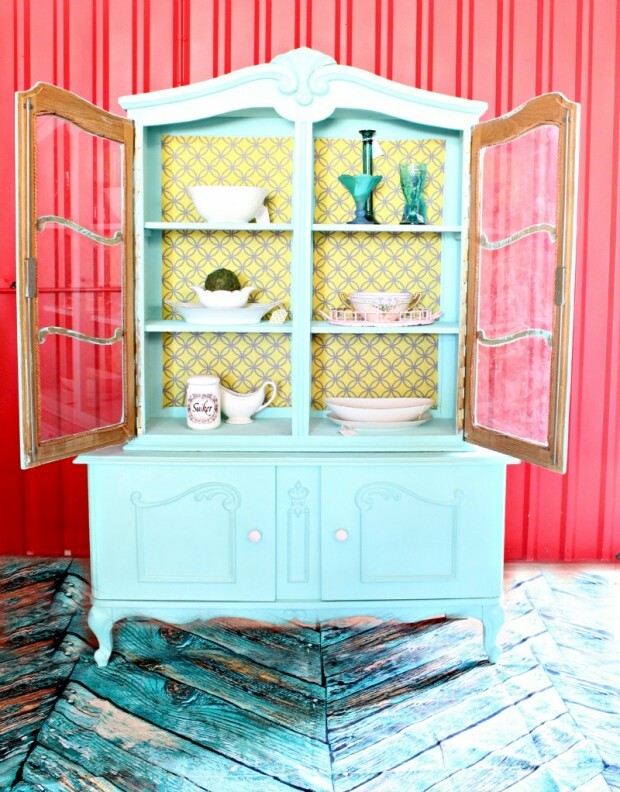 To lighten everything up, I’ve considered applying wallpaper to the back of the hutch. After seeing an example of this in Style at Home magazine earlier this month, it really has me thinking about it again. I’m also drawn to geometric patterns, but I’m not sure if something like this would be too busy to look at all day long. Or what about a hit of bold colour? 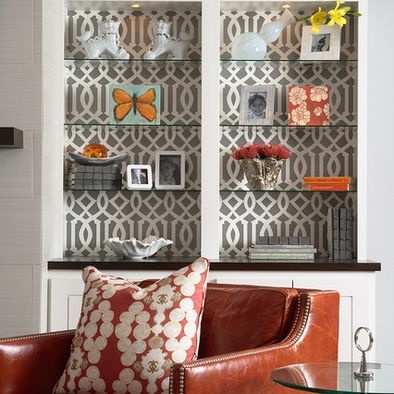 This wallpaper-backed hutch (actually done with fabric) definitely brings the piece to life. As an option, I’m also contemplating putting a piece of wallpaper or fabric on the desk’s surface covered with a piece of glass. 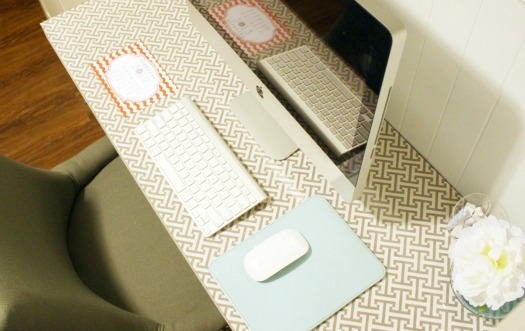 I love the hit of pattern Jen from IHeart Organizing added to her basement studio desk. 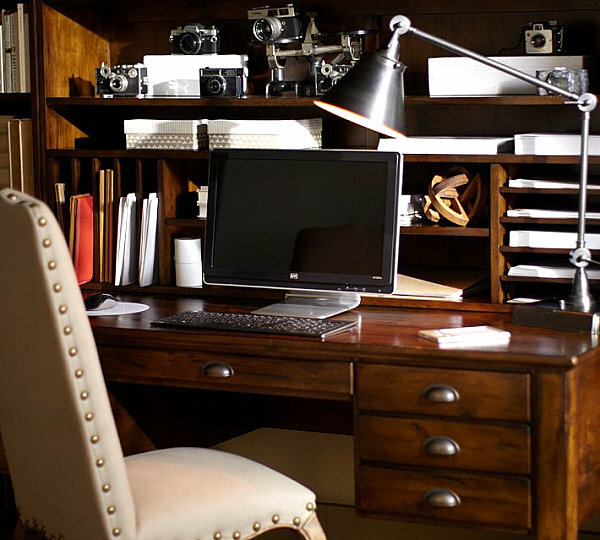 This desk with floral wallpaper is beautiful too. Which wallpaper (or fabric) option would you choose? 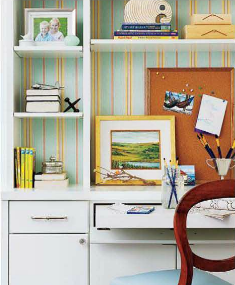 Do you have any other non-permanent ideas for freshening up my desk? I like the spring-y floral…but it could be just wishful thinking! Darn snow!! I can’t wait to see what you decide to do, I have a half redone desk parked in my garage at the moment! I love the floral as well and would add a touch of femenine to the heavy piece. That with maybe changing out the pulls for some glass knobs or something shinier like chrome would be fantastic! I have a desk that gets to be painted and changed up as soon as my husband cleans it out. Not looking forward to the task however the results will be worth it! I love the fact that you can change it up constantly. That would take care of my inability to decide! Oh, some really great ideas and pretty patterns too! I liked the one from IHeart Organizing, it’s not permanent and so if you do find something else or want it to change with the seasons – easy enough to do! Those are some great ideas that are hard to make a decision with! I love your bold color option. I just finished putting wrapping paper on my daughters bookcase. It helps knowing I can change it anytime I want.